To celebrate the release of the LP Precious Time 2.0, Raymond Brodur and Sebastien Charlier offer a special edition of the Golden Melody. This is a diatonic harmonica optimized for chromatic playing. 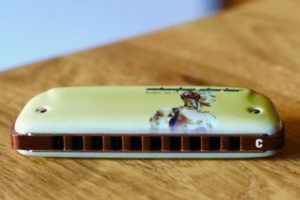 This Brodur harmonica comes with a new precious wood comb and a specific design on the cover plates, looking alike the album artwork. Reed plates are fine tuned by Sébastien. As a result, this harmonica is highly playable. The very flat comb makes the harmonica extremely airtight. The reed fine tuning also contributes to airtightness, and prevents reeds to squeak when overblowing and bending. These features make this harp perfect for a fine chromatic playing. 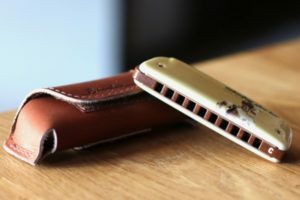 It makes complex melodies much easier to play than a standard harmonica. The sound is a bit more mat than an all wood Brodur harmonica. Very good price value for such a quality instrument. The Brodur Precious Time 2.0 is cheaper than other Brodur harps since Raymond Brodur has customized out-of-the-box cover plates instead of fully hand making them as he usually does for his wood cover plates. Materials quality: 3/5 (comb is made of precious wood but cover plates are not.